In October 2009, the Bunnell City Commission hired Armando Martinez as its city manager for $90,000. He’s now making $102,400, but says he’s never gotten a raise since he became manager. Thursday evening, he was up for a merit pay increase that would have brought his salary to $104,470, a 16 percent increase from his base pay. A 2-2 vote of the commission meant that the motion to give him the 2 percent merit increase failed. “I tell him all the time that Mr. Martinez is overpaid,” Commissioner John Rogers said, siding with Commissioner Elbert Tucker in opposing the merit increase. Mayor Catherine Robinson and Commissioner Daisy Henry voted for the raise, but it wasn’t enough: a tie vote means a failed motion. Vice Mayor Jenny Crain-Brady was absent: had she not been, she likely would have voted to support the raise, as she has been a staunch supporter of Martinez in the past. It’s quite possible that commissioners favoring the raise will bring up the matter again at a subsequent meeting, when they’re assured of a majority. But the discussion over Martinez’s pay—the latest in a series of such discussions in the last few years—again laid bare a fault line on the commission that opposes Tucker and Rogers against the remainder of the commission, and that points to how Martinez’s fate hangs in the balance, with elections coming early next year, when three seats are up—Tucker’s, Henry’s and Robinson’s. One of the leading candidates for the election, Bill Baxley, was in the audience Thursday evening, as he has been at most meetings since well before running for a commission seat at the previous election and failing to win a seat by 19 votes. He’s not been a fan of Martinez’s, and spoke skeptically of the merit raise Thursday evening. “If my memory serves me correctly, I would almost be positive that I heard Mr. Martinez say he’d be willing to recuse himself from it,” Baxley said of the merit raise, referring to a previous meeting’s discussion. The difference between Martinez’s base pay, when he was originally hired, and its current status bears explaining. His original $90,000 salary was for his duties as city manager. But he was also given the title of public safety director. Before becoming manager, Martinez was briefly Bunnell’s police chief. As a cop, +he was granted hazardous pay, even as manager, since he had the title of public safety director. That gave him an additional $6,000 a year, raising his pay to $96,000. In late 2010, questions were raised about Martinez’s right to be a public officer in two different jobs at the same time. The Florida Constitution forbids such a status. To his chagrin, Martinez had to drop his cop’s title (and his gun-carrying). He no longer merited hazard pay. But the commission decided not to eliminate that hazard pay, and even gave him a minor bump. In effect, he got a $7,500 raise in January 2011, though Martinez and his supporters on the commission do not see that as a raise. Tucker didn’t buy the argument. “The director of public safety position is really what you’re doing as a city manager, so you just got a little more money for being the director of public safety,” Tucker said. Then came the 5 percent “cost of living” increase all Bunnell employees got this year. It wasn’t exclusively a cost of living increase. Three percent of it was to compensate for the 3 percent that employees must now pay into the state’s public retirement system, by order of the Legislature (money most employees may get back should a lawsuit disputing that mandate go employees’ way). Two percent was a cost of living raise. That brought Martinez’s pay to $102,438. He was then evaluated. The evaluations could have been filled out by all commissioners, but only the mayor filled it out. She gave him a glowing review. “I did the legwork to do the evaluation. You all get to make the decision whether or not you want to give the merit increase,” Robinson said. That 2 percent additional, merit raise was what was under discussion Thursday, and what Tucker and Rogers resisted. The city’s finance director corrected Tucker, in that the calculation Tucker was presenting included the merit amount, not just the cost of living amount. But Tucker’s point was made: a salary increase at the top end of the sale is disproportionately higher than a salary increase for the rank and file. Two people—Bunnell developer Mark Langello and Perry Mitrano, the city’s solid waste director, in an unusual pitch on behalf of his boss, who’d approve Mitrano’s merit raise—spoke to the commission in support of Martinez’s raise. Robinson thought the 2-2 vote meant that Martinez’s raise had carried. Sid Nowell, the city attorney, corrected her. Martinez’s pay remains, for now, at $102,438, a 13.8 percent increase over his starting base pay—still well above the sort of increases most workers, if employed, have enjoyed over the past four years. That seems like quite a high salary for such a small town/city. I would think that money should be spent on hourly employee raises, those who are barely making ends meet. 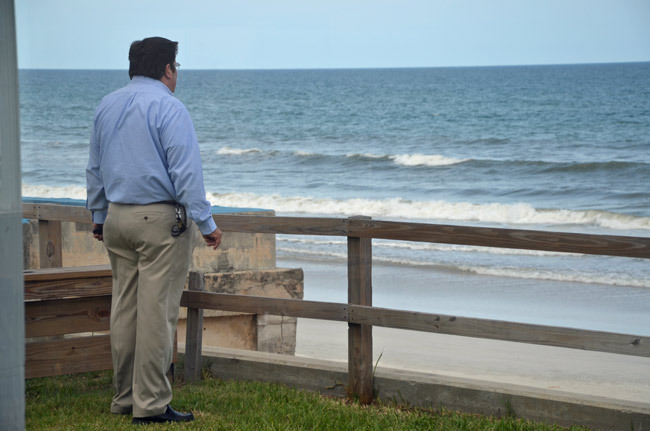 Mr. Martinez with all due respect, $102,000 plus in Flagler County is a lot of money…given what we, the residents of the county to fund these salaries make..Myself I have to make ends meet with half of that. As far is my concern all top officials; managers of county, cities, and schools are overpaid. But looks like is the American way! Please stop all the jibber jatter……your giving me a headache….he should be happy with what he making and I can’t believe everyone else doesnt have anything else to deal with! Are you kidding me, a pay raise?? He should be more then grateful that he has that job. Or let him try to find a real job in the private sector. How greedy people in Public jobs are. And shame on those commissioners that vote in favor. GET REAL!!!! Yeah! Rich is BAD! We all need to be equal, no matter that our educations and qualifications are not equal. This is the new way in the good ol USSA. What is wrong withe people of that city. This yoyo travel to & from Melbourne daily with car expense, free car etc. Their are approximately 3,000 people in Bunnell according to the 2010 census. With that said it would be about $ 34.00 per resident for service provided to manage your city. I think this is well within the guidelines, and probably should be more. Does he live in the city limits or pay taxes here? I don’t think so. Deep south , your out of your mind, that man should not be making more then $30 000, its Bunnell for christ sakes not Manhattan, this is why the cities lay off so many employees and why there is no jobs for anyone else they are giving it all to these good ole boys , its nonsense!!!!! You are out of your mind; First off he is not a good old boy. Second the position and education level required warrant much more than 30K. Maybe a 100K is high, but for 30 K you could have a person with no education bankrupt your city, this is not 1950. Go to a large metropolitan city such as Miami and the manager is over 200K with an assistant city manager and a huge staff, now would you like to really compare NYC? Martinez is laughing all the way to the bank. I bet he is thinking these southern folks are dumb as hell. I am afraid your numbers are a bit off. The general fund budget was $2,678,691 in 2011 which doesn’t include other monies coming in from the sale of their overpriced water, grants, etc. If you were to divide the general fund budget by 2,676 residents (according to 2010 U.S. Census), you would see that every resident pays a little over an average of $1,000 annually towards the administration of Bunnell. You must ask what additional services you are receiving for this annual contribution to the City. Imagine an extra $1,000 in your budget if you lived in the County instead. Paying this man over 100,000 annually is too much especially with his qualifications (or lack thereof). The best city manager bunnell ever had was david haas. I think he was lucky to make 50k. He made martinez look like he was running backwards. I speak for alot of citizens he is truly missed……..
Wake up the average merrit increase these days is 1-3 percent if the person is lucky to get it. Bunnell should get rid of this overpaid out-of-towner. Good Job John Rogers & Elbert Tucker for blocking his raise. I think it is crazy to pay that much, also considering the expense of a vehicle and fuel for him to travel to and from work. that must be nice. They claim their is no money to hire more police or city employees but the manager finds money for a raise…. fishy….Just Saying. Listen, Martinez is just the tip of the iceberg. The “City” is a wanna be led by a mostly incompetent commission that is not fiscally responsible due to the lack of intelligence and experience. So really why expect any more fr them. My Two Cents you could not have said it better. That was evident when the mayor thought a 2 -2 tie vote meant martinez got his raise. She has only been on the board 15+ years and did not know better. Maybe next election time we can break up the big three, robinson, henry and crain. The city is lead by Martinez and the 3 ladies, in which the chair thought a 2-2 tie means they won and Martinez got his raise. Could the iceberg finally be melting? There is an election in March for the city of Bunnell. This is not isolated to Bunnell, take a good look at the salaries that the leaders of Palm Coast are making. That could be a clue as to why our storm water fees are going up; our water bill is going up and people are moving out of Flagler county. When are those bright town councilors in Palm Coast going to catch on? Mr. Martinez, you need to go. Try to find another job with on a 4 year degree that pays 100,000 k. There will be a new major and commissioner next year. Enjoy the good life while it last. Bunnell will never change, the good old boys want to keep control, its as bad as the crooked county it sits in, wake up people farming is np longer supporting this county. They need to put a policy in place no two family members can work for the county, watch and see how many people would be looking for jobs. The plain fact is when Palm Coast broke away the county finance dwindled, heres an idea have Bunnell and FC residents pay what the citizens of PC pay, bet your all real quiet now. Really a city manager for the metropolis of Bunnell making a six digit income. Good for you Mr. Martinez south Florida values taught you how to get the most. You may be a competent city manager but $100k plus salary come on. You should be ashamed of yourself for overcharging the good people of Bunnell. I think it’s high time that Mayor Robinson be replaced. I am highly suspect that once she isn’t a factor, Martinez will aptly be put on the ropes!